This one of a kind "Tesoro" ring features a rare color of "green" Diamond. After learning that the color of the year for 2017 was "Greenery", we could not resist designing this new solitaire ring. Green Diamonds must have a unique mineral composition to reach their full color potential and this stone is an exceptional color. The entire design is hand engraved with beautiful hand-applied filigree which adds to the unique quality of this collection. "Tesoro" means Treasure, so we knew this new ring would represent this collection very well! The center green Diamond (.75 carats) is a modified oval cut with an amazing color. It is a center solitaire surrounded by a halo of round white Diamonds (.37 carats) and set in 18k white gold (8.7 grams) with hand-applied filigree is in 18k yellow gold. The shape of the mounting is considered a "Euro" style shank and the entire surface is hand engraved. 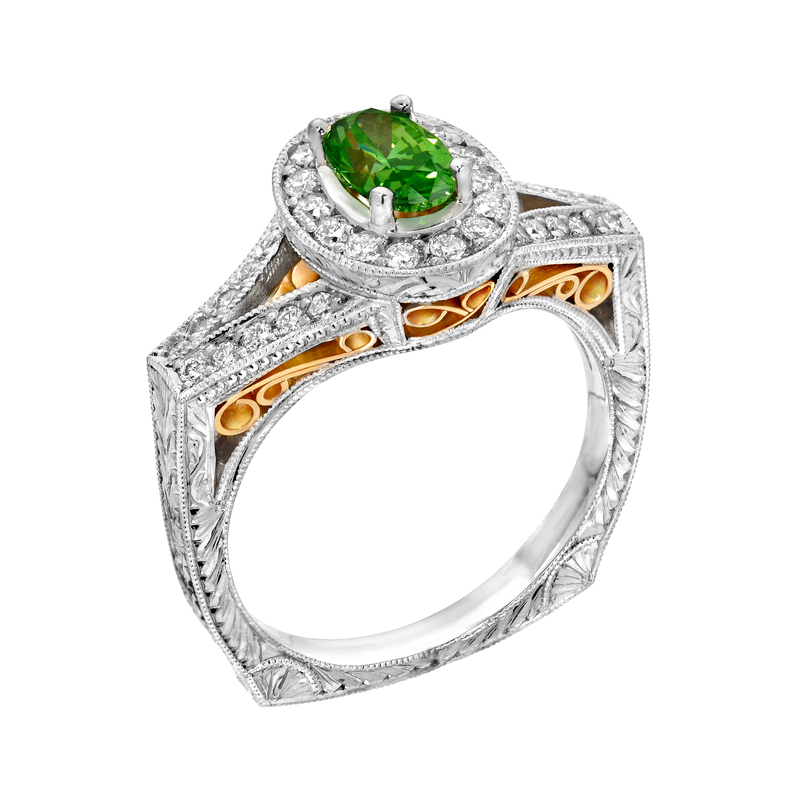 The green Diamond definitely makes this ring a one of a kind treasure.